How can major cities strengthen their role as global players without marginalising their citizens? One of the main challenges facing large cities and metropolitan areas is the contradiction between their important role in the global economy and society, and the unequal distribution, within their own territories, of the benefits derived from this role. One of the most visible faces of these inequalities is gentrification, a process that almost every metropolis in the world has experienced to a greater or lesser degree. The new Metropolis Observatory issue paper, "Gentrification and impoverishment of the metropolises", sheds light on this dilemma. The publication was launched last Thursday in Barcelona, at the public library of Poble Sec, a neighbourhood that original residents are progressively being forced to leave, due to rising living costs. The event was co-organized by the Barcelona Metropolitan Strategic Plan (PEMB, for its acronym in Catalan) and featured speeches from the author of the issue paper, the economist and sociologist Josep Maria Pascual, and also from experts who analyse the processes of gentrification from different perspectives. To introduce the publication, Pascual explained that gentrification, understood as a process of substitution of the working classes in certain neighbourhoods by others with greater purchasing power, is associated with the loss of the residential function of deteriorated neighbourhoods and their replacement by offices, business centres and/or tourist accommodation, the expulsion of traditional commerce, and the impoverishment of other metropolitan neighbourhoods. The author insisted on the metropolitan scale of the process and its consequences: "In metropolitan spaces, centrifugal and centripetal forces are activated, and in metropolitan areas there is a process of impoverishment linked to gentrification. It is important, therefore, to act with a territorially broad vision, focusing actions on the most vulnerable neighbourhoods", he pointed out. According to Sergio Porcel, PhD in Sociology and head of the Social and Urban Cohesion Area of the Barcelona Institute of Regional and Metropolitan Studies (IERMB, for is acronym in Catalan) gentrification does cause an increase in territorial inequalities in the first ring and in the metropolitan area of Barcelona. He assures that in the case of the metropolitan area of Barcelona, there is a predominance of more qualified population that is favouring the increase of center-periphery inequalities and urges to give the metropolitan change to the policies that are being done. On the other hand, Adriana Ciocoletto, PhD in architecture and urban planner, founding member of Col-lectiu Punt 6, a cooperative of urban planners, sociologists and feminist architects, has pointed out that both commercialisation and tourism must have preventive measures and be approached from the metropolitan point of view. She said that gentrification is a consequence of the capitalist system, with differentiating impacts with respect to gender. "The expulsion because of the lack of affordable housing in the neighbourhoods and the loss of proximity trade lead to the loss of social life, quality of life, vitality and mutual aid between women, who are responsible for 80% of the care and those who move around the neighbourhoods", she added. One of the main questions in the debate has been whether it is possible to promote the internationalisation of metropolises without causing the gentrification and impoverishment of their territory. According to Pascual, we should avoid speaking in terms of duality, i.e., global city or local city, because a metropolis does need spaces for internationalisation. The pressing issue, according to him, is where these spaces are placed: "We have to distribute them in a wider and polycentric territory, before giving up promoting international metropolises. Why shouldn't we make policies in an orderly way? Investors are already going into metropolitan spaces, but in a completely anarchic way. Collaboration and metropolitan planning are necessary," he said. Bringing a global perspective to the debate, Álvaro Puertas, secretary general of Habitat International Coalition (HIC) highlighted that the model of competition between metropolises implies exclusion. In order to leave no one behind, he suggested, instead, promoting collaboration between cities. Puertas affirmed that the process of commodification of the planet encompasses urban public space and housing, which become susceptible to be bought and sold just like any other product in the market. He stressed it is necessary to treat housing as right and not a commodity in order to promote social cohesion and quality of life, guaranteeing the right to the city and the metropolis. Puertas cited housing cooperatives and protected housing as examples of measures that allow policies to be made in a different way, across the wholeness of metropolitan territories. 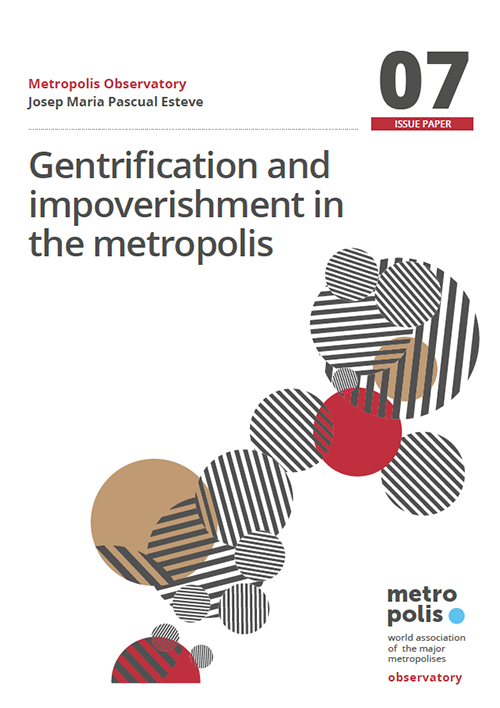 The issue paper "Gentrification and impoverishment of the metropolises" is the seventh in the Metropolis Observatory's collection of publications. This collection approaches a series of contemporary topics and challenges which local governments are facing in the area of metropolitan affairs. As a whole, the collection makes it possible to create a global metropolitan narrative.